There is no denying that Steven Spielberg is the king of blockbusters. With movies like Jaws, Close Encounters, ET and the Indiana Jones films, he has ruled the box office since the mid 70’s and is certainly one of the most highly regarded directors around. When he makes a film, people sit up and take note. However, in recent years his output has been less blockbuster and more serious, with the likes of Lincoln and The Post. His last family effort, The BFG, was a sweet-natured feature but lacked any real box office bite. 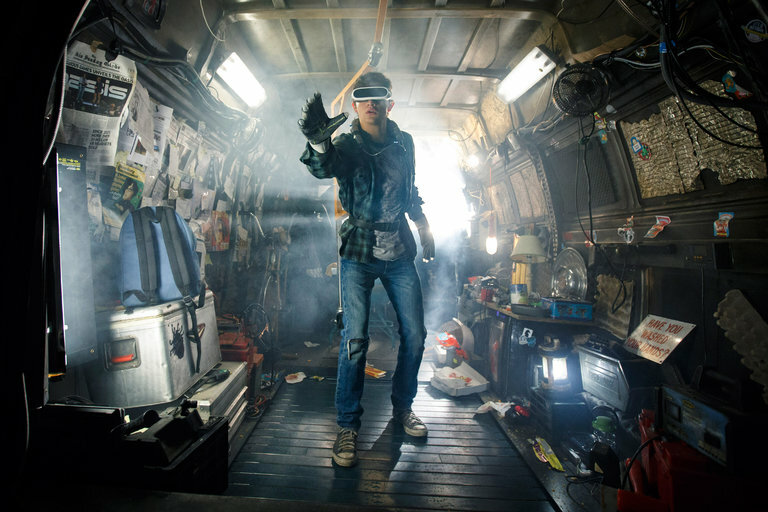 However, Ready Player One is the film which proves the Spielberg is back and having fun. Set in the near-future, where poverty is rife and people have found solace in a virtual reality world called Oasis, where people can be whatever or whoever they want. The creator of Oasis, Halliday, has died and has left three keys hidden within the game. The person who finds the keys will win the game and along with it, the company and all the wealth you can imagine. No one has even found one key until Wade, a young gamer living in a tower block of mobile homes starts realising that the clues to finding them are in the past of the creator. However, Wade has stiff competition from a huge corporation led by Sorrento, a man who wants complete control of the virtual reality world. Based on the best selling book by Ernest Cline, this is a cinephile’s dream. A film crammed to the brink of busting of references to movies, mainly of the 80’s. Everywhere you look there are items, posters, even vehicles belonging to films that you love, from Back To The Future to Jurassic Park, to Batman to Child’s Play and beyond. The fact is there are so many references it will make your head spin and it’s like playing a game while watching someone playing a game! Don’t panic though. There’s plenty for everyone to enjoy here. This is a film made mostly of CGI technology, as the human characters when they place their headsets on, we are all transferred to this magic land of bright colours and incredible creations. Among the visuals and references is enjoyable, if slightly predictable, an adventure that borrows heavily from Charlie and the Chocolate Factory. An eccentric creator offering his world to the winner of a competition. The Golden Tickets being the keys. Spielberg, a self-confessed gamer, has so much fun with the world of Oasis, as well as keeping the tension and the pace moving at a great speed so the extended running time of 2 hours and 20 minutes never feels baggy or dull while adding something for everyone. There’s a sweet romance for those who love a love story, there’s plenty of comedy and while you are being dazzled by the visuals, there’s always looking out for the references. Hidden behind the effects are some decent performances. 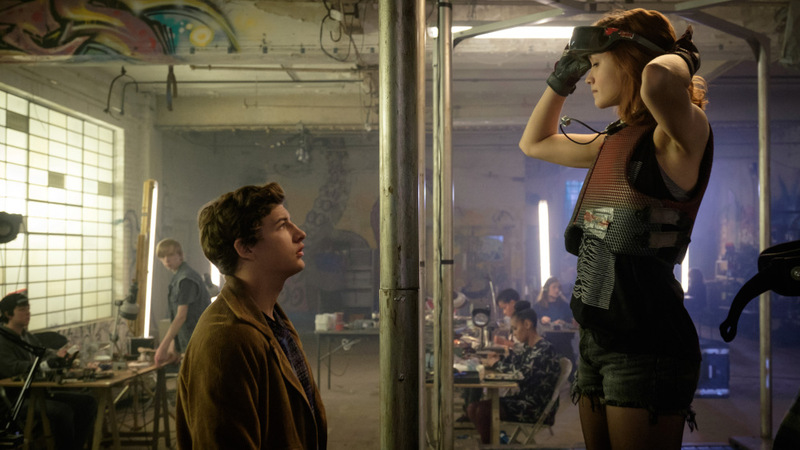 Tye Sheridan and Olivia Cooke make for an agreeable couple who find themselves drawn together to find the keys. Ben Mendelsohn is perfectly villainous as the baddie while the scenes between Mark Rylance, as Halliday and Simon Pegg as his former partner Morrow’s is fun. I really liked Ready Player One. It’s exactly what cinema was made for. Self-referential, exciting and hugely entertaining. Spielberg has always known what the popular audience wants and he has delivered in droves here. If there is one complaint, the 3D, which this film seems to be made for, is a little disappointing and so I am going to return and see it in 2D. Having said that, it didn’t distract too much from the enormous fun I had while watching and if the ending is a little cliched and predictable, getting there is just so much fun.